As with any paradigm shift, the idea that institutions must treat students as customers has come under heavy criticism. Higher education’s old guard has been resistant to this fundamental switch, but that resistance unfortunately leaves institutions unable to meet the needs and expectations of today’s students. In the face of overwhelming evidence, many detractors have been forced to admit that, “yes, students today are behaving like customers.” So now, rather than trying to argue that students aren’t customers, they’re instead arguing that treating students like customers will turn an institution into a degree mill. This line of argument, however, ignores the needs, goals and aspirations of the majority non-traditional student population, and that’s the focus of this video in the EvoLLLution of Higher Education series. Institutions absolutely need to treat their students like customers, and this is not a bad thing. The move to improve the student experience and student choice has led institutions to take great strides in efficient and effective management. It has allowed institutions to save resources and has improved the diversity of options available to learners. It’s led institutions to put as much attention on retention as has traditionally been placed on access, which has a significant impact on hitting the 60 percent attainment rate target. Focusing on Customer Service: Higher Education and the “Degree Mill” Debate: This EvoLLLution interview with Colorado State University-Global Campus President Becky Takeda-Tinker takes on the degree mill debate head on. Takeda-Tinker argues that, contrary to the degree mill argument, a focus on customer service actually creates the conditions for a more academically rigorous educational experience for students. Communicating with Students: This whitepaper by Destiny Solutions shares some best practices that have helped leading retailers and organizations forge strong relationships with their customers. 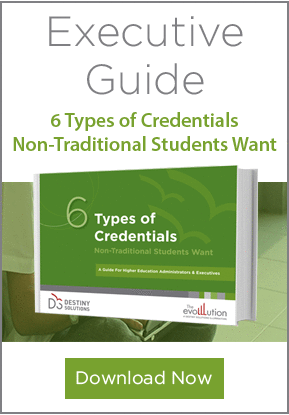 Specifically, the whitepaper shares how institutions can forge strong relationships with their students and effectively respond to their needs all the way from pre-enrollment to completion and beyond. It also outlines how this approach to institutional management can benefit both students and the institution. Differentiating “Customer Service” and “Degree Mill” in Higher Education: In this article for The EvoLLLution, Emerson College’s Executive Director for Professional Studies Lesley Nichols weighs in on the debate as well. She points out that some of the fear around treating students like customers comes from traditional higher ed’s resistance to the idea of having to prove a direct return on investment for students. Ultimately, she recommends college leaders assign a positive meaning to the idea of “student-customer” and shares three tips to help institutions adapt to this new reality. Profit-Maximizing Online Education Can Be a Positive Change: In this EvoLLLution article by Philip Mixon, who serves as the MBA director in the Sorrell College of Business at Troy University, the degree mill argument is explored through an economics lens. Mixon argues that operating the university as a business is absolutely essential given the financial realities of the higher education marketplace. He points out, however, that an institution offering an inferior product—truly acting as a true degree mill—would quickly be overrun by its competitors, just as any market tends to “correct” for market aberrations. There are a number of ways to react to the emerging consumer mindset of today’s students, but denying then ignoring the change isn’t going to lead to positive results for higher education leaders.